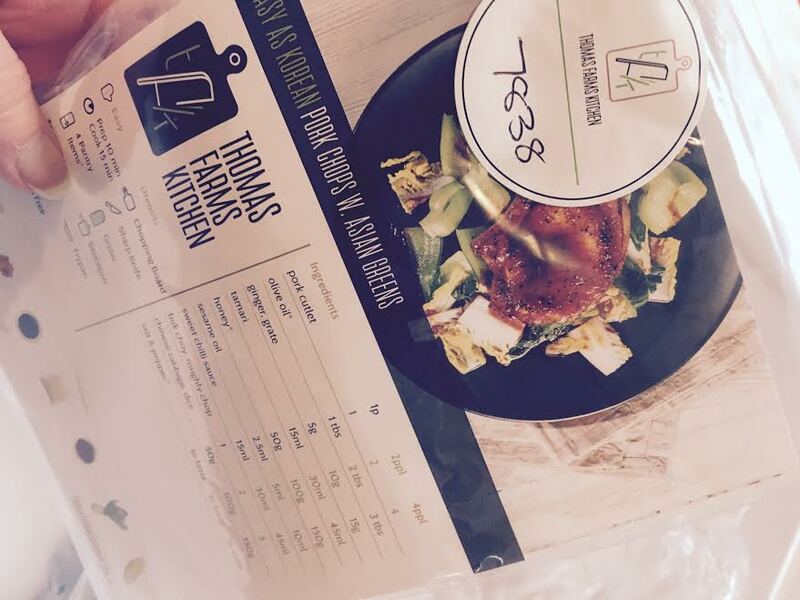 You can read all about their experience with Thomas Farm Kitchen here. 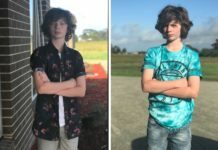 The only negative comments that we saw repeated numerous times in the reviews were that the standard meal sizes were too large for children, and were possibly a little too expensive for most households to use the service on a regular basis. Well, Thomas Farm Kitchen listened to that feedback and they’ve come up with a fantastic solution! 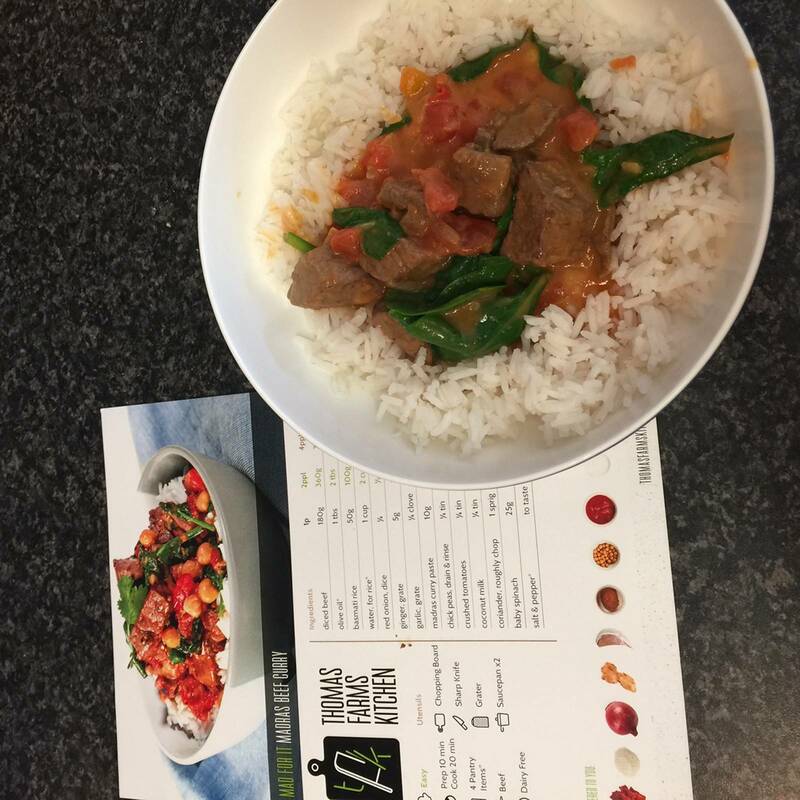 The family meal plan is based on either 4 adults, or 2 adults and 3 kids under 12 year of age and works out as just $8.39 per serve! 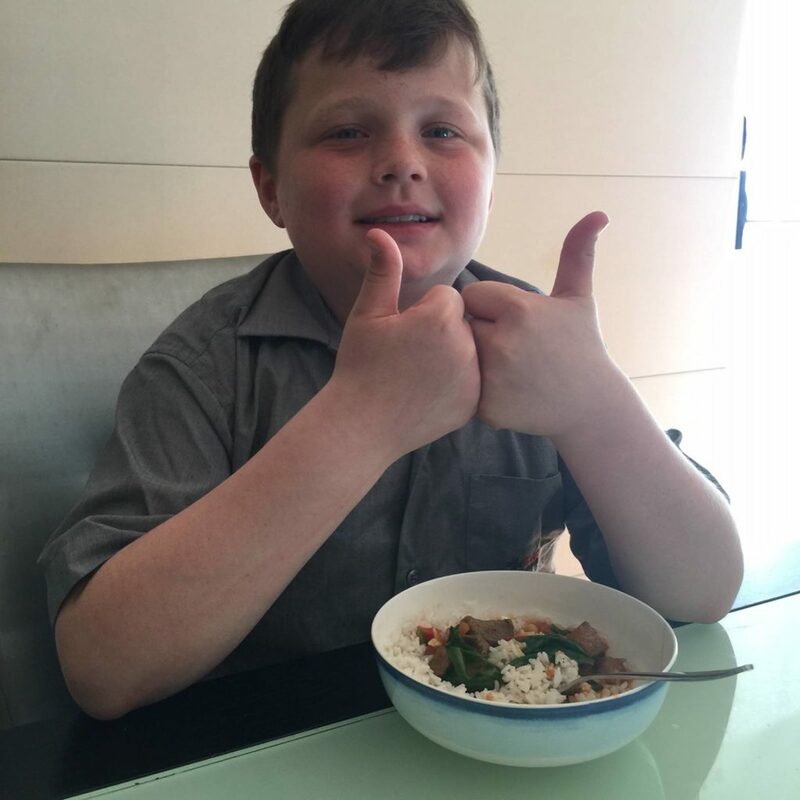 We invited some of our original reviewers back to trial the new family meal packs and share their honest feedback with the Mums Lounge community and they were excited to give TFK another go which just goes to show how much they enjoyed the experience the first time around. 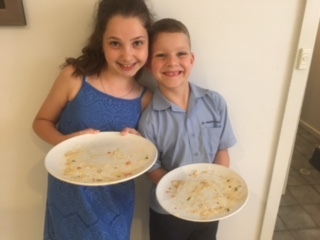 Of course, we loved the fact that TFK had listened to the mums of Australia and developed a family meal pack that was affordable and suitable for families! Here’s what our Mum reviewers had to say. The prices make it a more affordable option for a family. It was a big hit in the household, everyone enjoyed it. It took 30 mins prep & cooking time, and it was filling and enjoyed by all. Easy & quick to cook, fresh tasting and kids ate it and normally would refuse some of those ingredients. 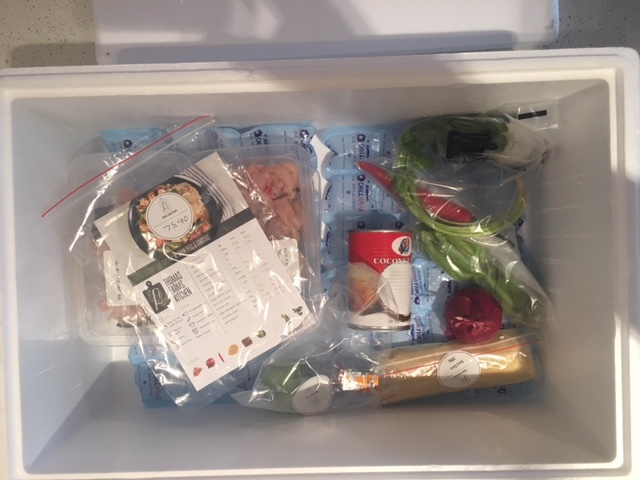 The things I liked about the experience most were the taste & freshness, home delivery, no supermarket shopping, and family eating different ingredients. It could have had a bit more rice to feed 5 of us, though. I love the ease of cooking and the different flavour combinations/ ingredients that the kids will eat. It’s a great option for an easy tasty dinner at home. It was fantastic to hear that TFK listened to our initial feedback. It made the experience even more worthwhile. The flavours were quite strong (salty, lemony, capers) for the kids. The adults loved it though. I think my partner wanted a carb in there, even if the veg could be carb based (like a potato or pumpkin, sweet potato etc). He mentioned he would have liked some rice, pasta, polenta etc with it. Overall, I loved trying something new. I love the stress of measuring and deciding on what to cook has gone. I enjoyed the flavours, although they were a little strong for the kids. 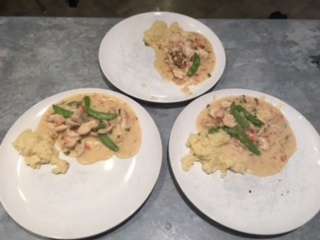 It was much better than my usual standard dinners and it required less effort as it was all measured out for me and the recipe card was easy to follow. I’m returning to full time work in January so we are seriously considering subscribing so that dinners are easier. I was relaxed knowing dinner was ready for me when I got home and I still like that I’m cooking (don’t want to feed the family pre-prepared meals). It was healthy. I have already been recommending Thomas Farm Kitchen and my dad has asked for details. He is retired and likes the idea of buying ‘just enough’ as they have a lot of wastage. Thank you for the opportunity to participate again. Family meals at real family prices is a wonderful additional to the meal options. 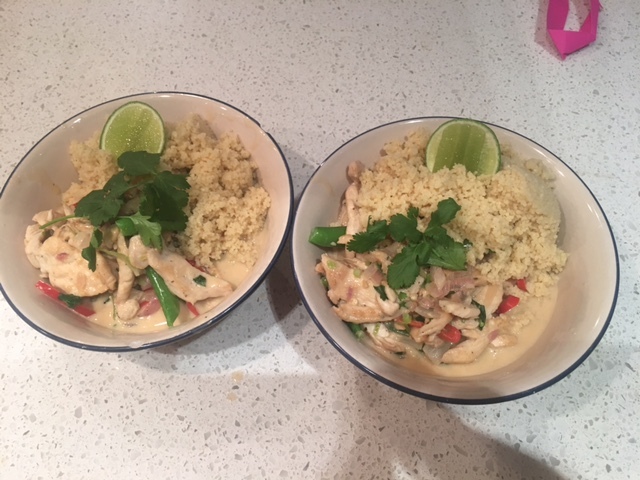 Our meal of coconut lime chicken with snow peas and couscous was a pleasure to prepare and eat. Everyone enjoyed the meal. The ingredients were of good quality and easy to prepare. The meal prices are reasonable for the family option. 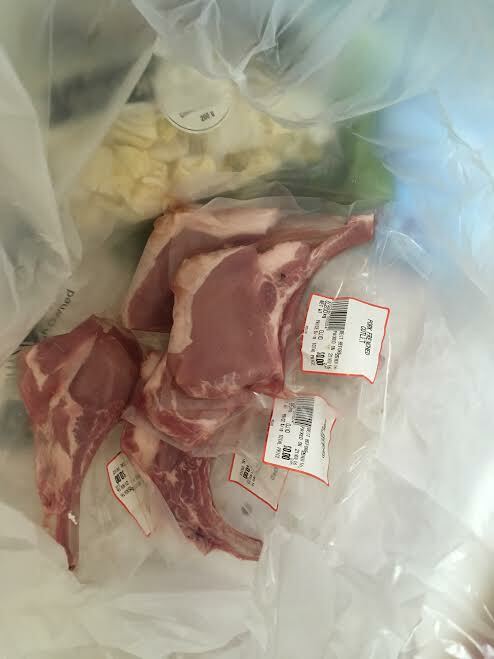 I often try and save money by buying reduced priced meat so Thomas Farms Kitchen is dearer simply because of this. The meal was straight forward and easy to prepare. Prepare time as stated on the card was accurate. Everything was there and ready to be prepared. No missed ingredients. The flavours were simple yet tasty. One step of the recipe appeared missing on the card. I was a little confused as to where and what to do with my prepared stock. 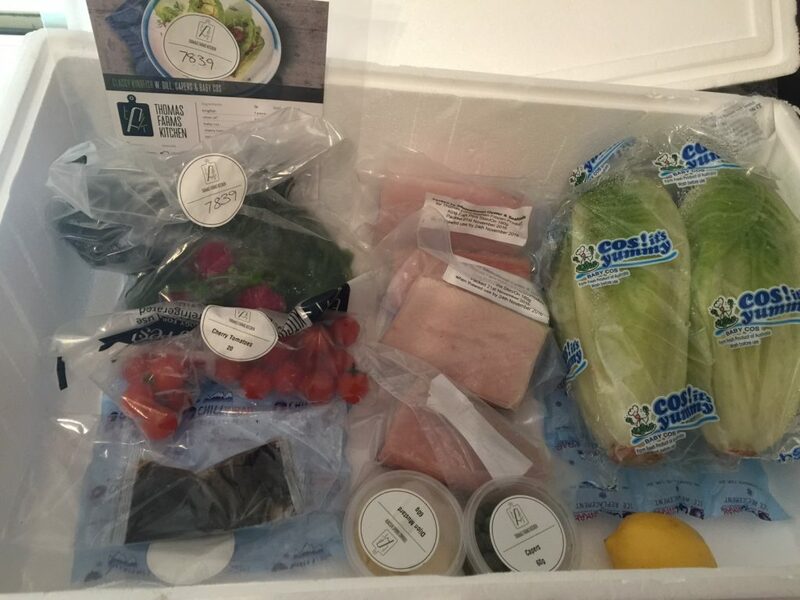 Great way of getting new meal ideas and the simplicity of everything being delivered is fantastic for our busy house. I am more than happy to share the enjoyment of cooking these lovely meals with friends. My husband and I thought it was nice and tasty but our two children weren’t keen. It was tasty and easy to cook. The kids wouldn’t eat it though as it had coconut milk in it and they tend to like plainer foods. The recipe card had a method in the wrong spot so that had us stumped for a bit but otherwise easy to follow. The result was tasty. Good value and nice to not have to think about what to cook and shop for ingredients. Also the recipe was very easy. 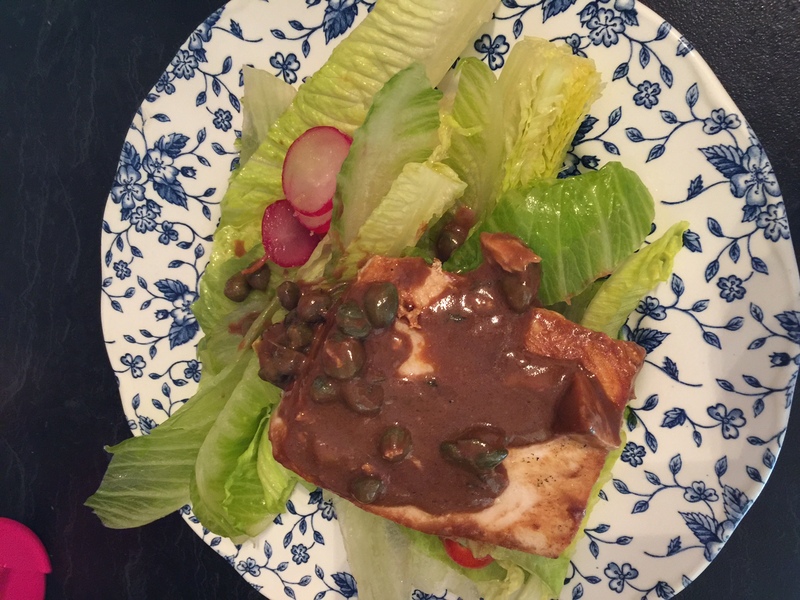 I really liked the quick and easy nature of this meal and the no shopping! Also trying something different. For our family it is a bit expensive compared to the cost of what we usually spend on dinner. It is nice now and then though and a good healthy alternative to takeaway. So probably be once in a while thing. 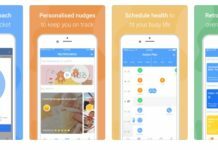 I would definitely recommend this to busy families with kids a bit older than ours. 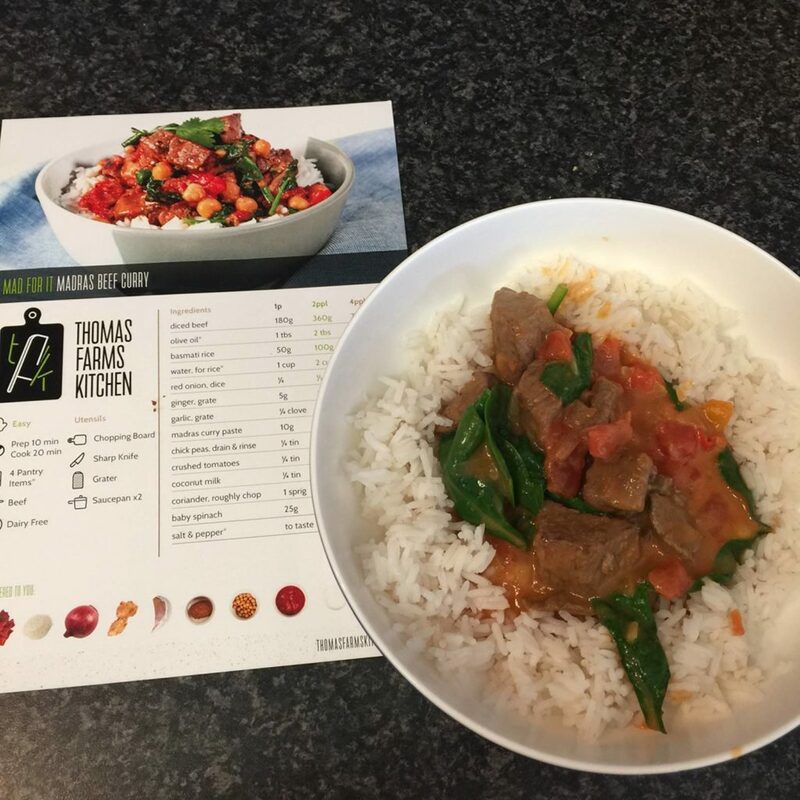 Editor Note: Thomas Farms Kitchen realised that they had mistakenly sent out the recipe card for the exotic coconut lime with snow peas and cous cous with two of the steps in the wrong order. They used social media to apologise to those affected, proving once again that they are a responsive business with a fantastic customer service ethos. I am very impressed that Thomas Farms Kitchen have taken on board our feedback, but not only that, they have acted upon that feedback (and quickly). It is very important to me because they have asked for our opinions and listened!! We thought it was fabulous! We received the Pork Chops with Asian Greens and honestly it tasted just like I imagined it would from reading the recipe! 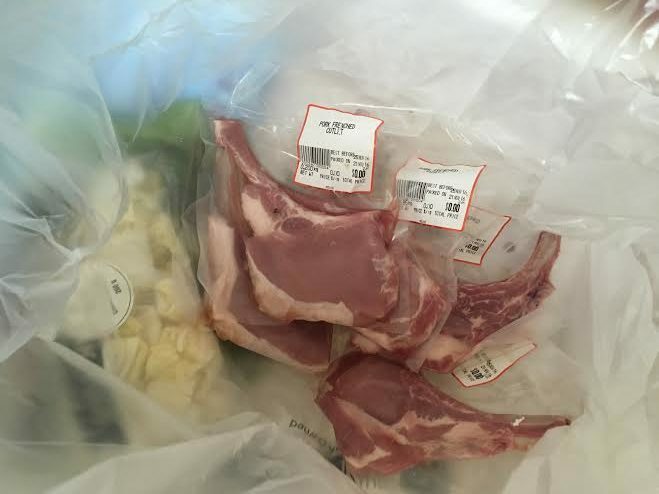 The pork chops were a very generous size and the Asian greens were fresh, and there was plenty to go around (I did add rice as my kids aren’t too keen greens generally, but so easy!). The sauce was delicious! We were all impressed. 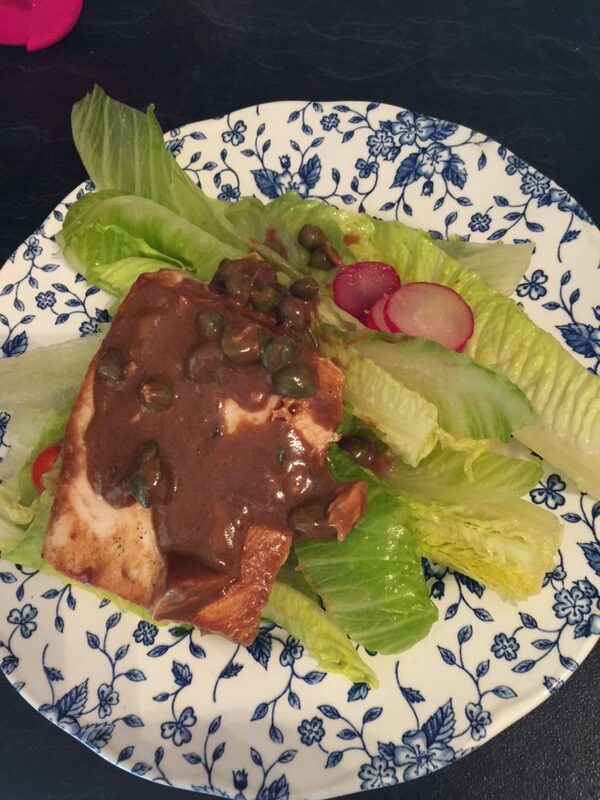 It was quick and simple to prepare, the portions were generous, and it was delicious! And all fresh! I think the meal plan service is very reasonable compared to our standard family dinner, price-wise at roughly $8 per head, and given it’s delivered to the door, fresh and all portioned out ready for preparation with clear instructions, it’s an A+ for effort too (when you compare that to deciding what to make, getting to the shops, traipsing around the shops, buying more than you need (or less) and THEN making the meal). The thing I hate most about dinner time is the planning of it so the fact that that aspect is taken out of the equation is a huge bonus! I liked the whole idea of the service. It takes all the ‘drag’ out of cooking for me. I get to do the fun part – the cooking, and giving the meal to my family, knowing also it is healthy and using fresh ingredients. All the stuff I dislike, the thinking (! ), the shopping, is taken away. I’ve loved trying new things. I love the variety. I love the way the recipe cards read like it’s someone speaking to you and going through the process with you. I love that I’m not buying a tonne of ingredients I won’t use again. Everything is portioned out, there is so much less waste. There is nothing I didn’t like about this experience. 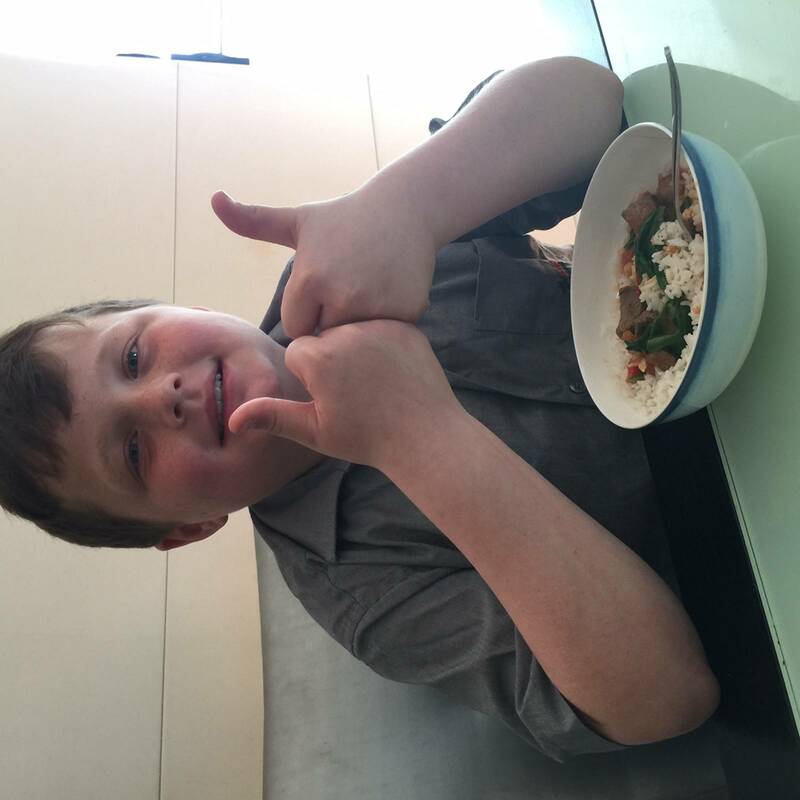 I feel very lucky to have been chosen to try it out – thank you TFK and Mums Lounge! The only reason I wouldn’t order right now is that I am not working at the moment and in theory have time to do all the boring stuff myself (without a real excuse not to)! I hope to start working again soon and would definitely order to save my time and effort! 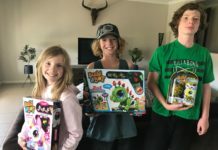 If you are sick of coming home from after school sports and having to think about what to cook for everyone, or if you are over meal planning and grocery shopping with kids, you’ll love Thomas Farms Kitchen. All produce is fresh, delicious and delivered to your door. You’ll be able to whip up a family meal and know exactly what is in it because you made it yourself from only fresh, wholesome ingredients! No preservatives or other nasties. 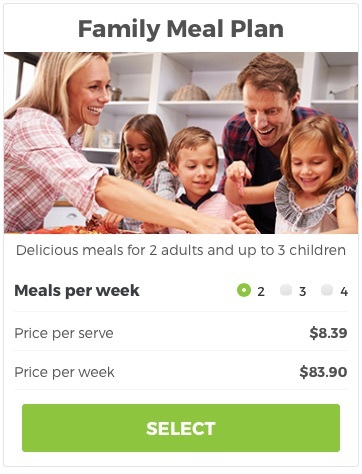 And at this new family-friendly price it really is a fantastic solution for busy parents who want to get out of the rut of cooking the same, convenient meals on a weekly basis, without having to invest extra time and effort. 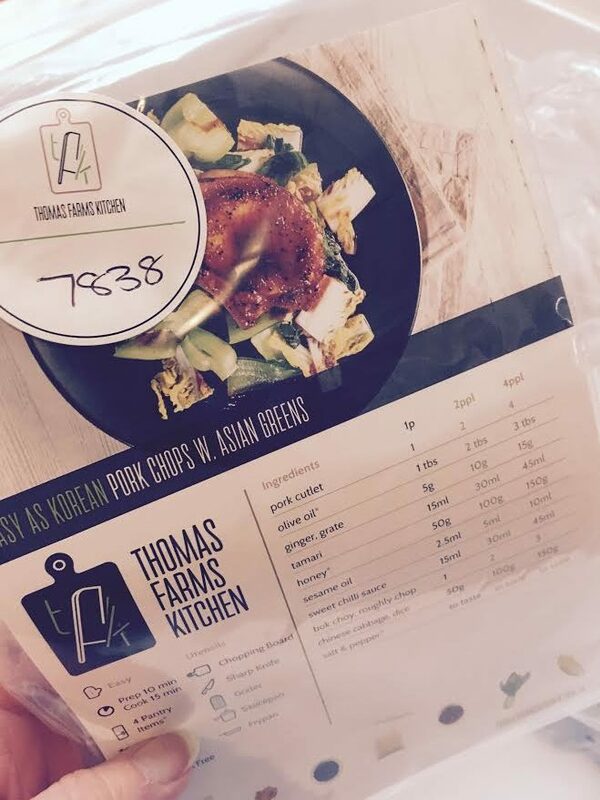 Keen to give Thomas Farms Kitchen a try for yourself? Now is a great time! You can get 50% off your first order! 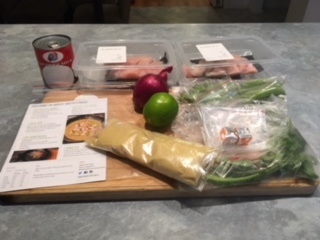 Visit thomasfarmskitchen.com.au and check out their delicious chef-created meals today. 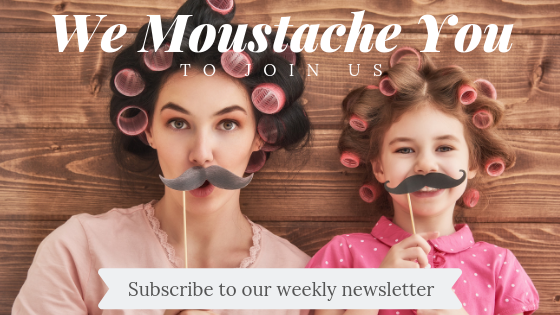 Do you want to try your hand as a Mums Lounge reviewer? Thomas Farms Kitchen have 3 major prizes of 1 family meal pack delivered each week for 4 weeks in Jan/Feb 17 up for grabs. Prize-winners will be required to undertake a product review by filling in a short survey and providing photographs each week. We will share the prize-winners reviews at the end of the 4 week trial with our audience, and your review may also be shared on the Thomas Farm website too. The Family Pack will be tailored to the winner family size – and timing of trail is subject to delivery timing confirmed with winner/s). Prize-winners drawn 2.1.17. For your chance to win complete the entry form below.